Andrei Vladimirovich Kobyakov (Belarusian: Андрэй Уладзіміравіч Кабякоў; Russian: Андрей Владимирович Кобяков; born 21 November 1960) is the Prime Minister of Belarus. He was appointed by president Alexander Lukashenko on 27 December 2014. Before this appointment, Kobyakov served as the President's Chief of Staff from 2012 to 2014. He was a Deputy Prime Minister from December 2003 to December 28, 2010. Andrei Kobyakov was born in Moscow in 1960. From the age of three he lived in the territory of Belarus. In 1983, he graduated from the Moscow Aviation Institute. From 1985-1988 he worked first as a senior master, then deputy shop superintendent, and deputy chief of Minsk Mechanical Works assembly plant factory. In 1991, he graduated from the Belarusian State Institute of National Economy. From 1989-1991 he was a student at the Institute of Political Science and Social Management of the PBC. From 1995 to 1996 he served as Deputy Chief of the Control Service and from 1996 to 1998 he was the Deputy Chairman of the Belarusian State Control Committee. In June 1998, he became President of the Belarusian State Concern for production and sale of light industry goods. He was appointed chairman of the State Control Committee on 2 December 1998 by order of the President. On 6 October 2000 he was appointed representative of the State in OAO "Belpromstroibank." From 2000 to 2001 he was the First Deputy Prime Minister of Belarus. On 24 September 2001 the President appointed him Deputy Prime Minister. He was the Economy Minister from 3 July 2002 to 24 December 2003. 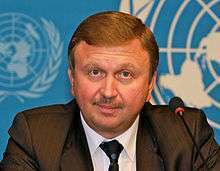 On 28 December 2010, he served as the Deputy Head of the Presidential Administration of Belarus. He was appointed Ambassador to Russia on 8 December 2011 and served until 2012. He was Chief of Staff to the President from 27 August 2012 to 27 December 2014. ↑ "Belarus Replaces Prime Minister, Central Bank Head". New York Times. Associated Press. 27 December 2014. Retrieved 28 December 2014. ↑ "Lukashenko Names New PM, Central Bank Head". ABC News. 27 December 2014. Retrieved 27 December 2014. ↑ "Belarusian Deputy Prime-Minister Andrei Kobyakov Appointed to EDB Council". Eurasian Development Bank. 16 August 2010. Retrieved 23 February 2016. 1 2 3 "Prime Minister of the Republic of Belarus". Council of Ministers of the Republic of Belarus.